Written by Katrina Mountford, Medical Editor. Dr Ben-Yehusa began by highlighting the key features of the EluNIR™ (Medinol Ltd.) ridaforolimus-eluting stent system, including variable strut width and frequency, allowing uniform dosing; an elastomeric polymer that remains intact post elution; and a pushable and visible spring tip. This novel stent is being evaluated in the Study of BioNIR Drug Eluting Stent System in Coronary Stenosis (BIONICS), a global prospective, randomised, multicentre study that enrolled 1,919 patients with symptomatic coronary artery disease and include a “more comers” population, i.e. one that closely represents the real-world patient population. Patients were randomised to the EluNIR™ stent (n=958) or the Resolute™ Integrity (Medtronic Inc) zotarolimus-eluting stent (n=961) The primary endpoint was the 12-month target lesion failure (TLF), a composite of cardiac death, target vessel myocardial infarction (MI) and ischaemia driven target lesion revascularisation (TLR). Baseline clinical and angiographic characteristics did not differ significantly between the two groups except the EluNIR™ group had a slightly higher percentage of current smokers and severe calcification (both p=0.03). At 12 months, the EluNIR™ stent demonstrated a TLF rate of 5.4 % compared with an identical rate of 5.4 % for Resolute (p=0.0013 for non-inferiority). Angiographic results also demonstrated non-inferiority of the EluNIR™ in terms of in-stent and in-segment late lumen loss (LLL) and in-stent thrombosis. 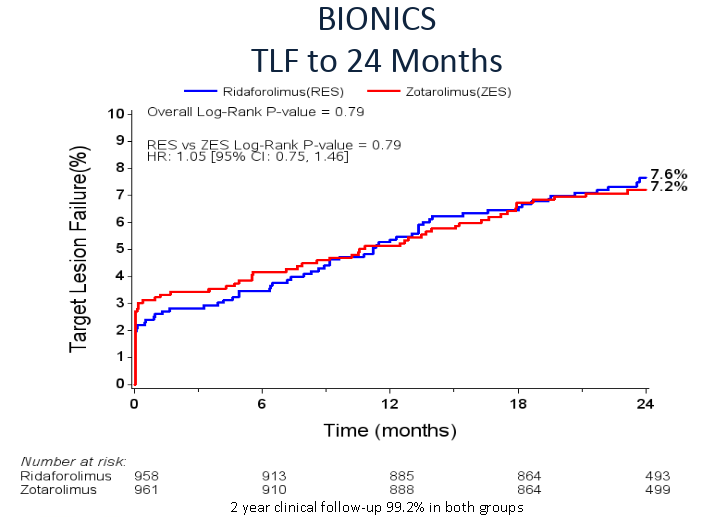 Results at 24 months show that non-inferiority had been maintained, with a TLF rate of 7.6 % with the EluNIR™ vs. 7.2 % with the Resolute group. The 24-month follow-up rate was greater than 99 % in both groups. Definite/probable stent thrombosis was 0.5 % in the EluNIR™ group vs 1.0 % in the Resolute group (p=0.28). However, the risk of stent thrombosis beyond 30 days was lower with the EluNIR™ (0.1 % vs 0.5 %, p=0.10). The EluNIR™ also showed a favourable low TLR at 2-years despite patient and lesion complexity. As a result of the BIONICs trail data, the US Food and Drug Administration (FDA) has approved the EluNIR™ stent system.1 Two year outcomes of the study continue to support the safety and efficacy of the EluNIR™ in patients representative of real-world clinical practice. The study will continue to follow patients for up to 5 years. 1. FDA, EluNIR® Ridaforolimus Eluting Coronary Stent System - P170008, https://wwwfdagov/MedicalDevices/ProductsandMedicalProcedures/DeviceAppr... Accessed 6 March 2018, .